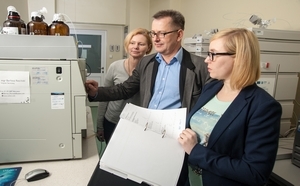 The pharmacokinetic laboratory at the Faculty of Veterinary Medicine of University of Warmia and Mazury – the best faculty of veterinary medicine in Poland –(is pleased to announce that it) has received the certificate of Good Laboratory Practice. It will be able to conduct the research required for the approval of medicines for marketing. At the beginning of November, the Faculty of Veterinary Medicine of UWM has received a certificate acknowledging the fact of satisfying the highest European standards concerning the quality of pharmacokinetic research, that is, the standards of Good Laboratory Practice. The certificate was issued by the Bureau of Chemical Substances in Łódź. It is the central authority of the Polish government administration, which is directly supervised by the Health Minister. Such a document is recognized throughout Europe and is valid for 2 years. It took the workers of the Faculty more than 2 years of intense work to gain the certificate. The laboratory, located at the Department of Pharmacology and Toxicology, is the only pharmacokinetic laboratory operating at the Faculty of Veterinary Medicine in Poland and one of only 3 laboratories working at the Polish universities. Why is gaining the certificate for the 2 years so important that the workers of the Faculty dedicated more than 2 years of their work to this quest? - Well, a certificate of Good Laboratory Practice is a document which is recognized throughout Europe. It confirms that in terms of research quality we have achieved the very best standard. It is very important because a producer who plans to market a medicine can now commission our laboratory to conduct research on its pharmacokinetics. The results of the research will be recognized by the administration of all European countries and the European Medicines Agency which decide on the approval of marketing the medicines – explains Prof Jerzy Jaroszewski, Director of the Department. The experience gained by the team in preparing the laboratory to a successful certification may help with gaining similar documents for other laboratories at the Faculty or University. - It took 2 years of intense work to gain the certificate. We expect that its confirmation in the future will be easier because we will not start everything from scratch – says a post-graduate student, mgr Agnieszka Jasiecka, who serves at the Faculty as a coordinator of a quality management system and who, at the same time, was responsible for preparing the pro-quality procedures during the endeavor to obtain the certificate. Pharmacokinetics is a field of pharmacology which investigates the history of medicines in the organism. Such research is mandatory while registering any medicine, whether it is used for people or animals.